Dropped from a broken skull dreadguard. Just to clarify, I got five of these today in about an hour and-a-half of camping Torgiran. All of them came from the Broken Skull Bloodguards in the two areas around the bridge. I had cleared the mines almost completely, picked up two of the ores off the Bloodguards on my way by, and cleared the fortress with no drops. When I came back out, I wiped out the entire area on both sides of the bridge and got three more ores. Point being, don't waste your time on the crazed miners. The Bloodguards have the ores you seek. Took me about 3.5 hours today to get all 4 from killing nothing but Bloodguards. Cleared both sides of the bridge then went down into the tunnels. Wiped out everything in there including the Overlord. They were repopping when i made my way back to to the bridge and went through that cycle over and over. The first 2 dropped within 30 min but those last 2 took the most time. /Agree. I killed my way through the tunnels with no luck. Started killing the Bloodguards in the large open area and to the other side of the bridge and had all 4 i needed in 5 minutes. The RNG is fickle, so I don't want to read too much into two people's results. But I killed every delirious/crazed miner in sight with no ores, then got a couple from the bloodguards near the bridge. I still have to return another day for the rest. Spend 45 Minutes in Torgiran Mines killing nothing but Broken skull bloodguards and it drop 3 times in 45 minutes time. 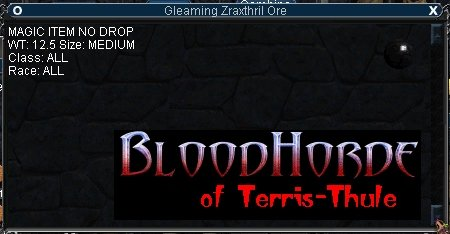 Went to Torgiran mines yesterday to get me 4 of the Gleaming Zraxthril Ore, killed all the broken skull bloodguards on both side of the bridge before I went in to the maze of tunnels in search of crazed miners, 1 Gleaming Zraxthril Ore dropped from the bloodguards, however, this maze is no fun after some minutes running around, I decieded to move back to the bridge area for the bloodguards, these where also lightblue to me as lvl 61 where as a majority of the mobs inside the maze are green. After having cleared the bloodguards on both side of the bridge 3 times (respawn is aprox 10 min) I had my 4 Gleaming Zraxthril Ore! Now onwards to the hole! FYI U all doing the quest as I type. You can no longer attack the crazed miners. I tried to cast a spell on it & I get the message spell did not take hold. Just figured I would let people know since Alla says they drop the ore. I am on my 68 Gnome Necro. Hope this helps. You must have had the QUEST version of the Crazed miner targeted. The first one you meet in the caves is for the bard song quest, and you cant kill him. Go further back past him and you will find plenty more that you can kill. In addition to the bedroom area, there are several more crazed miner spawns in the cul-de-sac southeast of the bedroom area. I got two of my four drops from this area - the other two in the bedroom area. I had to clear the spawn 5 times to get the four drops. Fyi , I just looted a gleaming ore off of a Dread Guard as well. They are not mentioned above. Well I thought I was doing well; for my epic 1.5 I had collected four in about 45 minutes. Gated back to PoK and went through my packs, when I realized that I had 2 Gleaming Zraxthril Ores...and 2 Zraxthril. Looks the same (black non-stackable no-drop sphere) but is apparently useless. Now, I have to go back and get 2 more. Killed everything from zone in to Overseer's room and got all 4 in about 1.5 hours. Good luck. Did this in about an hour and a half...seems pretty fast compared to others. It was quite easy as well. I used force shield on myself, dotted 4-5 mobs at a time, and just sat there and let my pet whoop on them, checked corpses, and off to 4-5 more...seems a little easier then doing one at a time and waiting...if that helps at all. Theres also a neat quest while you are there. The keys the guards drop, if you turn about 5-6 of those keys into the Resistance Miners, 4 captains spawn, which inturn make the overseer targettable. the loot is 50hp no drop stuff...good for twinks. 70 shaman and 70 necro took 1hour to get the 4 pieces. i been killing everything in zone ... i got one... its been to long on this uncommon item... its more like ultra rare. Got 2 off a Crazed Miner! Need 4 ores for second Epic Quest. Biddliss in Steamfont asks for 4 to combine in a satchel for him. Farming these off the Crazed Miners in the bedrrom area in the SW of the zone is definately the place to go.... nothing dropped the whole route there, 2 dropped in about 30 min in that little area. How do you get to Torgiran Mines from POK?? Maybe I just got lucky tonight, but I had 2 of these drop off of the Broken Skull Bloodguards at the bridge area after only killing maybe 7 or 8 mobs. I must be unlucky, then. I've spent 6 hours in the Mines; 3 with the miners and 3 with the Bloodguards at the bridge (both with a small group of 60+ people, so were clearing the area) and have seen zero. I've had this drop off a Broken Skull Bloodguard once but it was one drop out of well over 200 of these guys. Crazed Miners seem to drop it the most common and it's easy to set up an AE group and kill the miners fast. I got both mine from the Crazed Miners in about 3 hours, but some of that time was spent wandering around lost.